Nationalism is the issue of our age. 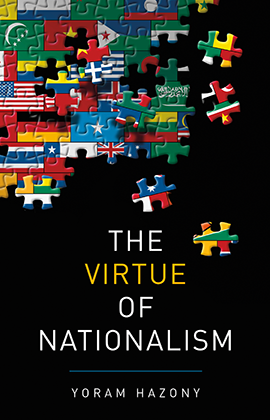 In The Virtue of Nationalism, Israeli philosopher Yoram Hazony makes the positive case for nationalism in an honest, reasoned, morally unflinching way. This book offers an eye-opening rethinking of the modern political experience. It recounts how English, Dutch, Scots and American Protestants revived the Old Testament’s love of national independence—and how their nationalism freed them from the vision of world empire promoted by the German-Catholic Holy Roman Emperors. It was this Protestant reconstruction of the political world that brought national freedom to peoples from Poland to India, and from Israel to Ethiopia. But since the 1960s, the tide has turned against the ideal of national independence. Both in America and Europe, “globalists” now see unfettered national self-determination as having been responsible for two World Wars and the Holocaust. The answer they have offered us—“global governance”—is well-intentioned. Yet in advancing it, they have reawakened hatreds they didn’t count on: The old war between Protestant nationalists and Catholic universalists that destroyed much of Europe in the 17th century has returned. Hazony argues that in view of this renewed clash between nationalism and universalism, we will have to make a choice: Either a world of independent states, or a renewal of the ideal of universal empire—which means, inevitably, American empire. The Virtue of Nationalism compares the options before us, and suggests that if it’s freedom we want, we should fight to preserve a world of independent nations.